It’s early Sunday morning and I’m playing around with a few photos I took in my small garden, which is in dire need of a makeover. I had given up on it completely this year and then I visited a garden nursery and decided to splash out on some sale goods – three pots of herbs and two hanging baskets – so that I had a bit of colour. I’m having a go at putting together a small slideshow just to see if I can technically manage to get it on my blog. I then decided to edit one of the photos which was too blurry to use. I cropped the photo and used the basic editing facilities available on an Apple computer. 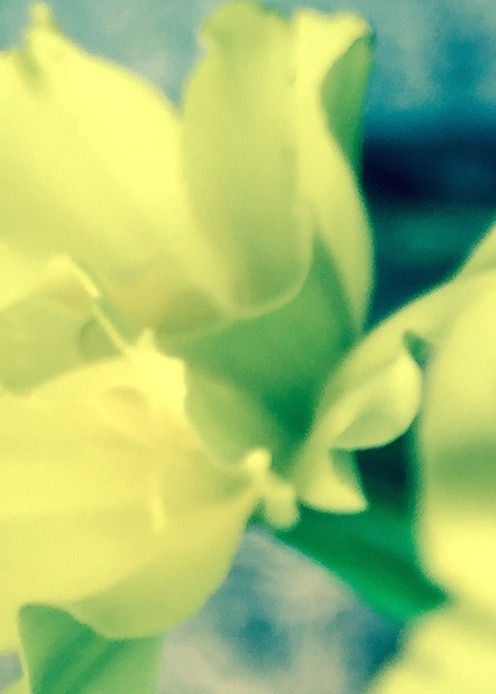 I love the colours and the abstract shapes created by the lines of the yellow flower. To me, I look at it and see deep blue sea and turquoise sky in the distance.